A one-percent tax on New Orleans hotel sales should return to city coffers, as it was decades ago before that local tax was halted to let the state collect its own tax revenue to build the Superdome, says a new report from the watchdog Bureau of Governmental Research. The transferred revenue, estimated at $12.3 million for this year, should then be devoted to critical city needs such as drainage and street improvements or extra police officers, says the report, released Wednesday (Jan. 30). The document comes as Mayor LaToya Cantrell is pushing for a larger local share of New Orleans hotel tax revenues, reducing revenue from some tourism-oriented groups to spend more on infrastructure. BGR’s report recommends restoring the one-percent hotel tax suspended in 1966, with New Orleans collecting roughly a half-penny. The report also recommends possibly rededicating to the city some existing hotel-tax revenues for tourism that the report suggests are excessive. 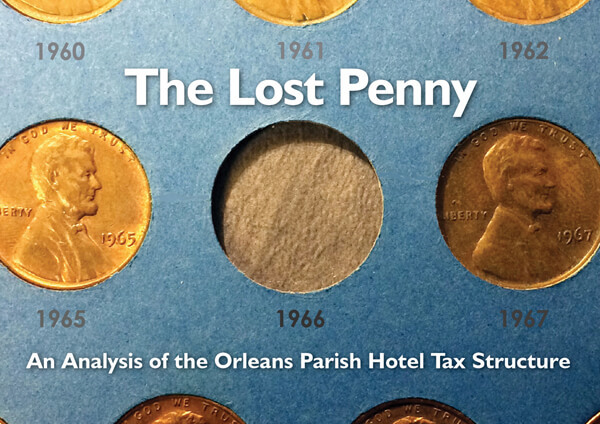 BGR’s report, titled “The Lost Penny,” says hotel taxes in New Orleans are set to total about $200 million in 2019. Those revenues are raised through a complex web of state-set hotel taxes and assessments, the report said, and mostly go to a cluster of tourism-focused groups including the Ernest N. Morial Convention Center and the Louisiana Stadium and Exposition District, which oversees the Mercedes-Benz Superdome. Amid criticism over much of the hotel tax structure, BGR’s report maintains that a heavy share of those taxes should remain dedicated fortourist-centric purposes to help drive economic gains. But hotel taxes overall, the report says, needs some tweaking to strike more of a balance between support for the local tourism industry and better maintaining the city’s infrastructure. Representatives from those groups as well as top state officials have already panned Cantrell’s pursuit to rededicate hotel taxes, though she has yet to offer a concrete proposal publicly. BGR, meanwhile, holds firm to its position that some of these groups, particularly the Stadium District and the Convention Center, may be getting more than their fair share in hotel taxes, while the city’s basic infrastructure and safety needs remain underfunded. That position was expressed in a 2015 report BGR issued examining the overall New Orleans tax structure, including property and sales taxes. The new report Wednesday traces the history of how a 1 percent sales tax levied on hotel rooms was suspended in 1966 by the New Orleans City Council, aiming to help ease the burden on the Stadium District’s effort to build the Superdome when the NFL awarded the city the Saintsfranchise. BGR says the city’s portion of hotel tax revenues has stayed stagnant since then, even as a flurry of additional hotel taxes and assessments has increasingly benefitted tourism groups. The report recommends state lawmakers restore that 1 percent hotel tax for the city. The extra city revenue, BGR says, could pay for the city to upkeep a third of the shoddy streets currently lacking funds or to cover the salaries of about 120 police officers. “Restoring the ‘lost penny’ of the hotel tax could provide significant recurring revenue to address citizens’ needs for improved infrastructure and services,” the report says. To reach part of that penny tax, BGR’s report suggests lawmakers could add a local hotel charge to the general state sales tax the Legislature renewed at 0.55 percent last year. Some tourism industry leaders pitched the same idea last month as a counter-offer to anything Cantrell may propose. To capture the remaining 0.45 percent, BGR recommends lawmakers either shrink the current state hotel tax rate to make room for New Orleans’ extra share, or rededicate existing revenue to city coffers. Gov. John Bel Edwards and Louisiana Senate President John Alario have already said they oppose the latter idea. Overall, BGR’s report says that of the $200 million expected from hotel tax revenues this year in New Orleans, the city will take only $18.9 million for non-tourism municipal purposes. The lion’s share will go to the Stadium District and the Convention Center, which the report estimates will receive $60.5 million and $52.1 million, respectively. Echoing its 2015 report, BGR’s latest report hones in on the Convention Center’s large unrestricted reserve fund, which swelled from $63 million in 2002 to $235 million. The convention center gets revenues from a 1 percent hotel tax, two separate hotel tax dedications and a citywide food and beverage tax, according to the report. The Stadium District, meanwhile, is required by state law to spread its tax revenue surpluses among local entities, including the city. But since 2001, district officials have elected instead to deposit surpluses into a capital fund, the report says. Further, BGR’s report says state law allows nearly all of the existing hotel taxes to remain indefinitely or in perpetuity, shielding them from periodic public review or the need for recipient groups to argue the merits of any tax renewal. By continuing to reissue bonds for new projects and refinance debt, the Stadium District has managed to hold firmly to revenues from hotel taxes that would end under state law once debt is retired, the report says. On this point, BGR’s report calls for state lawmakers to set expiration deadlines for hotel taxes. It also suggests a periodic legislative review of all hotel tax dedications in New Orleans.